Fairytales, where objects touched with magic turn to gold, meet the reality of faith’s powerful touch. 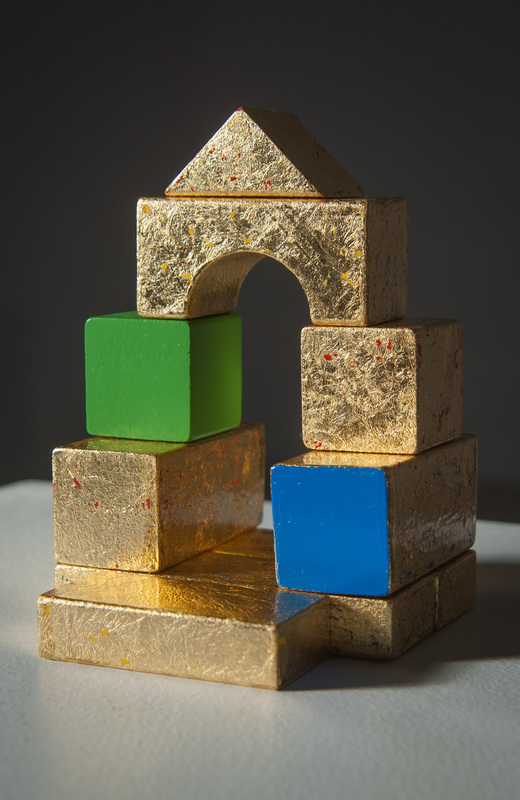 This stack of blocks, both intentional and playful, explores the parental paradox between fears that our children will inherit our struggles, and the goodness of a spiritual inheritance in the life of the family. The work was created from applying gold leaf to the surface of colored, varnished building blocks, allowing color to show through the cracks and imperfections of the surface. The Kingdom of Heaven is Like series began as a simple desire to make a piece of art with objects I had on hand - my son's building blocks. The small gold-leafed sculpture is the first art object I had created since becoming a mother, and it felt like a symbol of how small acts done in faithfulness can reap vast fruit. I photographed the tiny dwelling in Boston's Kenmore Square neighborhood - the first real home my husband and I had after being married. This project, along with an accompanying article, was featured in CIVA's "Like a Child" issue of SEEN Journal in the Spring of 2013. Learn more here. Digital prints are available upon request. Please inquire for sizing and prices.